SALT LAKE CITY - Canadian Trey Lyles received his first round of applause inside the Utah Jazz arena Monday evening as he sat in the stands watching summer league action. The No. 12 overall pick signed with the team in the afternoon and fans were thrilled to finally see him in Salt Lake City nearly two weeks after the NBA draft. 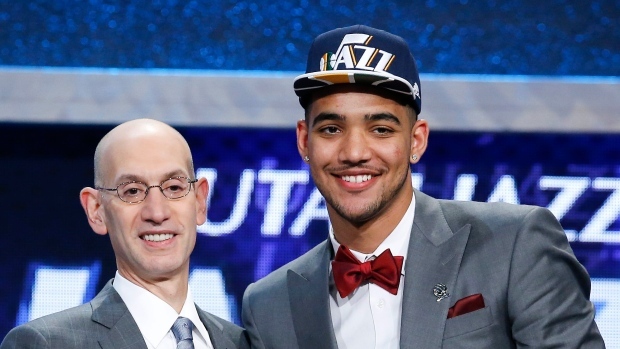 Lyles is the first Saskatoon-born player to be drafted into the NBA. Details of the deal were unavailable. Lyles laughed when asked about the rumours that swirled while he went unsigned. There was talk of haggling over money and whispers that the club was considering various personnel moves. "I thought it was pretty funny," Lyles said. "Media puts out a lot of stuff out there. That's their job. It's all good, I'm here now and that's all that matters." Neither Lyles nor summer league coach Alex Jensen could say when the rookie from Kentucky would suit up for the Jazz. The team plays their final game of the Utah Jazz Summer League against the 76ers on Thursday before travelling south for the Las Vegas Summer League. The team plays its first game Saturday. Lyles said he's confident he can pick up things quickly. He has been in his hometown of Indianapolis working out while the contract was being negotiated. "I'm a competitor, I want to play," Lyles said. "It's just up to the coaches. "I think I'll fit in good. It's a very open offence. The court is spread and bigs have the ball a lot at the top of the key and they have to make decisions. I think I'll fit in pretty good." The 6-foot-10, 241-pound Lyles averaged 8.7 points and 5.2 rebounds at Kentucky and was named to the Southeastern Conference All-Freshman team after his lone collegiate season. The forward has a 7-1 wingspan with large hands, and Jazz general manager Dennis Lindsey said after the draft that Lyles can get bigger. The team fell in love with Lyles' versatility and believes he can eventually grow into a stretch-four role with the development of his jump shot. "We got with him a little today, but it takes a while," Jensen said. "You want him to feel comfortable in the offence before he goes out there. So, I'm sure we'll be with him tomorrow and then kind of go day-by-day with that."